The final day of the 2018 888poker LIVE Festival London £1,100 Main Event kicked off with just 21 players out of a 656-entry strong field still in contention, all aiming to take home the trophy and first-place payout of £121,000. While the field was cut down swiftly in the first two levels, the final table would turn into an endurance challenge that lasted until 2.30 a.m. local time at the Aspers Casino at Westfield Stratford City. 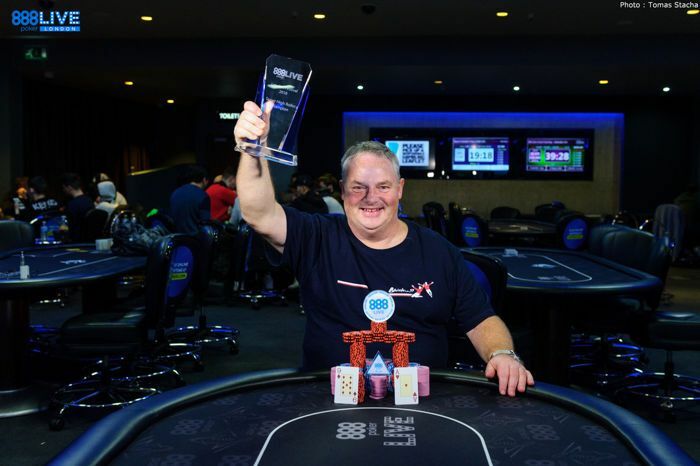 Ultimately, it was British poker pro and cash game specialist James Williams that took home the lion's share of the £649,440 prize pool, defeating recreational player and decorator Derek Lawless heads-up to lift the trophy. The heads-up portion itself only lasted half an hour and two gutsy moves by Lawless determined the outcome when he put Williams to the test and was caught bluffing. Antoine Labat, who finished 9th in the 2018 WSOP Main Event in Las Vegas, had to settle for 3rd place. The Frenchman dominated the late stages of Day 2 and the entirety of the final day with sheer aggression but came short in his bid to bring home the trophy to France. "I just couldn't win an all in against a short stack for two days," Labat shrugged after he had just collected his payout. He displayed the full array of his poker skills at the final table with a tremendous jack-high bluff against Lawless, who he had battled with several times throughout the late stages of the tournament. The final table also featured Hak-Hyun Lee, Philippe Souki, 888poker online qualifier Christos Xanthopoulos, and Craig Sweden. 888poker.es ambassador Fernando Pons finished in thirteenth place, Kelly Saxby bowed out in sixteenth place. Only 21 players returned to their seats with £6,100 locked up, and the first two levels provided plenty of fireworks, as the field was quickly down to the last 13 hopefuls. Among the early casualties were the 888poker qualifiers Martyn Duell and Helmut Hauser, Fuad Serhan, and Kelly Saxby. For Saxby, her run came to an end in sixteenth place after her pocket kings were cracked by the ace-king of Hak-Hyun Lee. 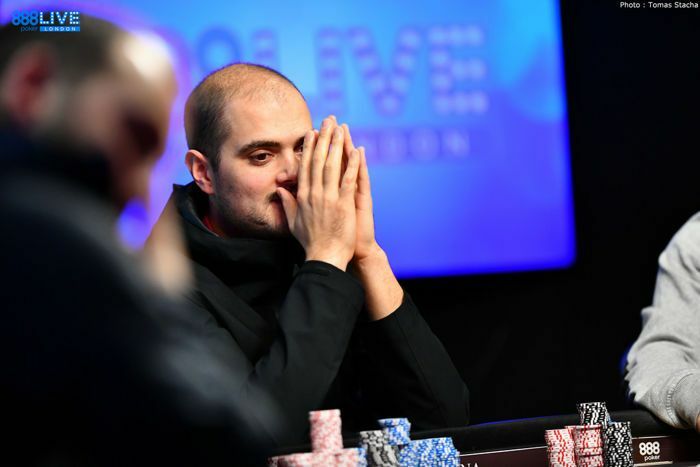 Once the action resumed after the first break of the day, Fernando Pons failed to hold up with pocket jacks on the feature table, and Christopher Kyriacou ran out of chips with pocket nines, both times a pair of eights had been the culprit. Antonios Onoufriou and Lam Van Trinh fell victim to the hot run of Adnan Dacic on the outer table, and that set up the nine-handed final table. Several players clung to their short stacks for an extended period and it was Craig Sweden that bowed out in ninth place after running into pocket aces. 888poker online qualifier Christos Xanthopoulos ran out of chips just a few minutes later, and it wouldn't take long to reduce the field to the final six. The exit of Philippe Souki was heartbreaking, as his top pair and top kicker with ace-king was cracked by the ace-four suited nut flush draw of Labat as another heart showed up right away on the turn. Another stalemate followed with several players ending up all in and at risk. Often it was Antoine Labat that attempted to deal the final blow, but it was Derek Lawless that had Aleem Kanji on the ropes with pocket eights versus ace-eight. Kanji found no help on an eight-high board and stuck around near the feature table to rail his friend James Williams on the way to victory. Adnan Dacic was among the seventeen players that entered the tournament with 12 big blinds at the start of Day 2 and turned that into a payday of £31,000. The Serbian flopped top pair and a gutshot with king-queen but ended up second-best to the queen-ten for top two pair of Labat. Hak-Hyun Lee seemingly hovered between five and fifteen big blinds for many hours and laddered up several spots to finish in fourth place. Down to the last three, the chip lead was traded back and forth, and it was Antoine Labat that came up short. In a three-way pot, Labat flopped an open-ended straight flush draw, and Derek Lawless looked him up with the king-high flush draw. Another club appeared on the turn, and Labat found no miracle on the river. Only a few hands into the heads-up duel, Lawless turned his second pair into a bluff and jammed the river to put Williams to the test. It was not enough to get his opponent to fold king-six for top pair, and Lawless was left with a 1-9 chip deficit. Two dramatic double ups later the race was wide open once more, but another gutsy bluff with the busted nut flush draw was one too many, as Williams found the call with king-four for counterfeit two pair to end the festival in East London the early morning hours. It was once again a very successful festival for 888poker at the Aspers Casino at Westfield Stratford City, and all guaranteed prize pools were easily surpassed, some of them even smashed such as the Opening Event, the £2,200 High Roller, The Whale, and of course the £1,100 Main Event. Some of the biggest names in poker made the trip to the UK including the last two WSOP Main Event champions John Cynn and Scott Blumstein, 2018 WSOP Main Event runner-up Tony Miles, and ninth place finisher Antoine Labat, Michael Mizrachi, David Peters, and a host of 888poker ambassadors. The £220 Opening Event missed the trademark number of the sponsor by one entry, and 887 total entries ensured that the guarantee was smashed. There was a six-way deal on the final table and Arvydas Budvytis claimed the trophy and second-biggest payday of £17,000. 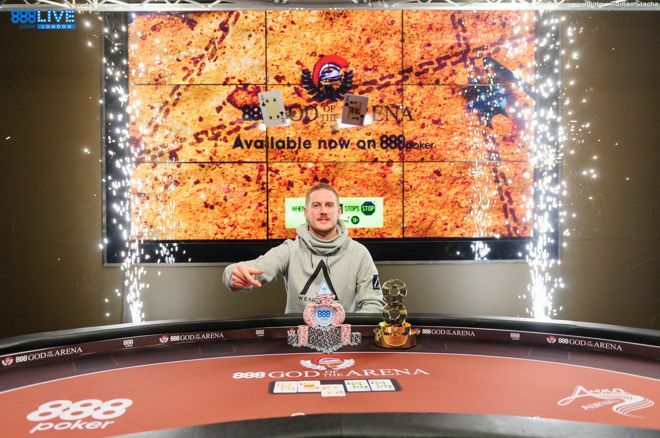 Right after, the £2,200 High Roller Event nearly tripled the guarantee and fellow Lithuanian Matas Cimbolas struck a deal with 2017 888poker LIVE London Main Event champion Tom Hall to claim the lion's share of the prize pool. Chris Da-Silva topped a field of 145 entries in the £150 The Whale Side Event and kept the trophy on British soil. 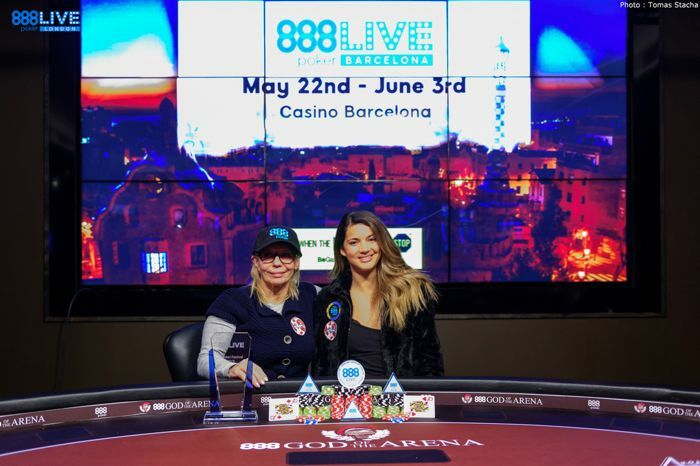 In the Ladies Event powered by Poker League of Nations, three-time UK Deaf Poker Champion Natalia Drytchak defeated 888poker ambassador Sofia Lovgren in heads-up. 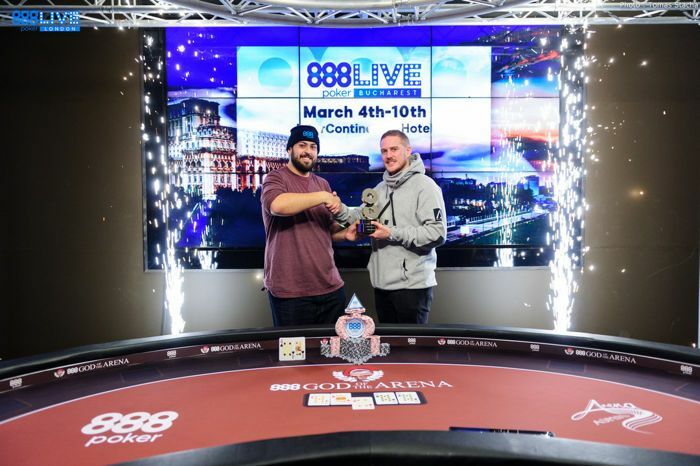 The event drew 25 entries, and Drytchak claimed a prize package valued at €3,100, which includes first place cash, a package to 2019 888poker LIVE Bucharest, and a Tiffany bracelet. “I ran like god, from hand one,” a delighted Ian Hunter said after he had topped the £5,000 Super High Roller, knocking out Chris Moorman and Manig Loeser on the way to victory. He also faced off against the 888poker ambassadors Ana Marquez, Dominik Nitsche, and Parker Talbot, but nobody could stop Hunter on his way to victory. The top three spots shared a portion of the £57,600 prize pool, and Hunter was the dominating chip leader when the money bubble had burst. Down to seven big blinds, 888poker ambassador Moorman shoved and was called both ways. Hunter flopped trips kings and bet the river to force out Loeser. “I lose,” Moorman immediately said and shook hands with Hunter, who replied "great playing with you." What followed was a very brief affair in heads-up and Hunter also sent Loeser to the rail in a hand that sums up his run good quite well. Hunter flopped top pair with ace-nine, Loeser turned second pair with king-jack, and they got the chips in. The river was a blank and Hunter celebrated, collecting £28,800 and the trophy for his efforts. Loeser received £17,300 and Moorman cashed for £11,500.